Make sure you have your sound on!! 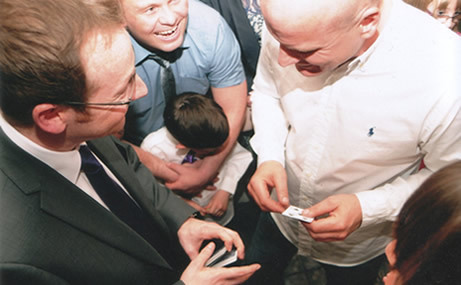 Mark has entertained at hundreds of weddings and is one of the UK’s leading wedding magicians. With amazing sleight of hand he mixes and mingles with your guests, astonishing feats of close-up magic making the perfect ice-breaker during pre-reception drinks or while photos are being taken. During the wedding breakfast Mark will go from table to table, working around the courses, and performing more amazing closeup magic suitable for all ages. Uniquely among similar performers Mark can create customised, bespoke magic for your particular special day – personalised magic that will leave your guests talking for weeks afterwards. From his previous experience with performing at weddings Mark knows that the wedding speeches can often overrun! So he can offer an additional mix and mingle with your guests in the evening, keeping them amazed and entertained until the wedding breakfast is finished. Mark’s incredible magic is a wonderful addition to your perfect day. "A huge thank you for making our special day extra special. Guests were still talking about you weeks after our honeymoon. We think you will be very busy as we have had lots of people asking for your details! Look forward to seeing you at our friends’ wedding soon." Mark's love of close-up magic is evident when he's performing within intimate settings and usually no more than a few feet away from his audience. His combination of sleight-of-hand manipulation, clean sense of humour and audience interaction is a great addition to a special occassion. Contact Mark today on 07834 773044 or via the contact form below. "The magic was amazing and Mark’s manner and approach simply perfect for bringing together groups of people who started out not knowing each other. By the end of the evening they were friends united in their wonder at Mark’s skills. Simply brilliant, I can’t recommend Mark highly enough." Mark works with a group of professional magicians that specialises in business magic and entertainment. He ensures your brand stands out from the crowd, and that your event creates a favourable long-lasting impression on each and every one of your guests. His unique combination of magic, entertainment, marketing and business skills is a value-for-money solution that enhances communication with your audience by capturing and holding their attention. More than just an entertainer, Mark has a thorough understanding of brand awareness, business and marketing. 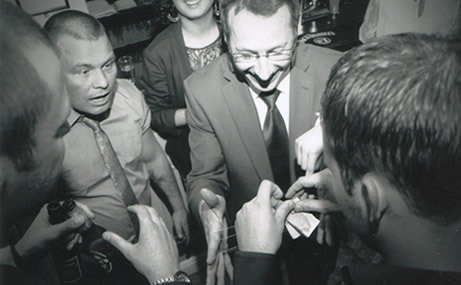 Mark can perform at corporate dinners and private functions, socialising with your guests as they arrive and during dinner, performing close-up magic right under their noses! Mark gives audiences at a product launch or promotion something unique to talk about and remember the event by. Grabing their attention and holding it by integrating magical and entertaining performances full of shocks and surprises. Furthermore, Mark can assist in television and film productions. Much magic, including card and coin manipulations, is the result of many years of practice and training. Actors will not have the necessary skills to make authentic-looking magic, so we can step-in during those all-important close-up shots. Please complete the form below with as much information as possible and I will get back to you within the working day. Alternatively, I am always happy to discuss your event personally and you can call me on 07834 773044.